On tripadvisor, 130 people have left their comments on Café Marly, that's quite a lot, but the result is (as so often on that site): none. All judgements differ wildly between "great restaurant" and "worst bistro of the world". Love and hate are confusingly mingled, 11 users give "excellent" as their final result, 18 rank this café-bistro simply "terrible" - and all of this doesn't really come as a surprise. 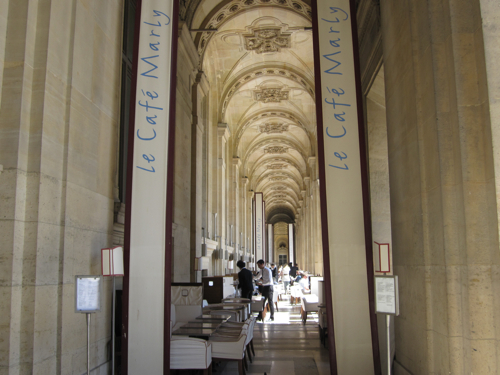 Café Marly is spectacularly sitting under the arcades of the Louvre itself, it's facing I.M. Pei's glass pyramid and making part of the "grand cour" of the Louvre. Now ask yourself: What do you expect of a bistro inside the Louvre. Great cuisine? You're kidding. Friendly waiters? Not very probable. A nice meal in the company of locals? Not at one of the world's top tourism magnets. So maybe it's about ambiance? Splendour? Grandeur? Yes. And that's what you get at Café Marly. Forget about the food. It is unfair to say it's terrible, it is impossible to call it great. It's just average food without surprises, the meals are fairly well prepared and they are overprized, of course. You can have a Cesar's salad for 15 € (20 US$) and a glass of mediocre Sancerre for 7 € (10 US$). But that's not why you're here. You've come because you were curious, weren't you? 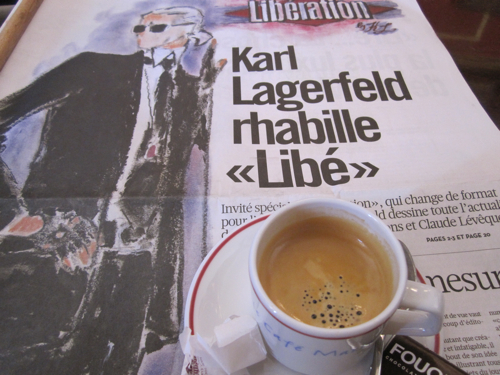 How does a bistro inside the Louvre feel? How does it look? Well, here you are: it's looking great. 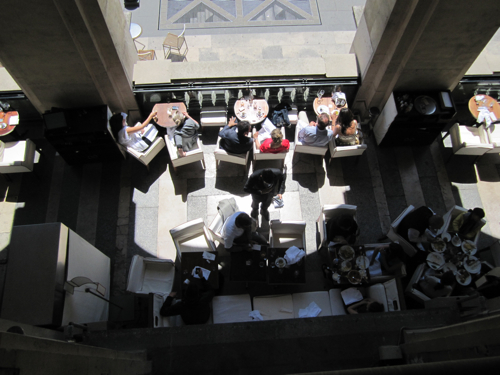 The terrace under the arcades is nothing less than miraculous. Hard not to feel like a king. 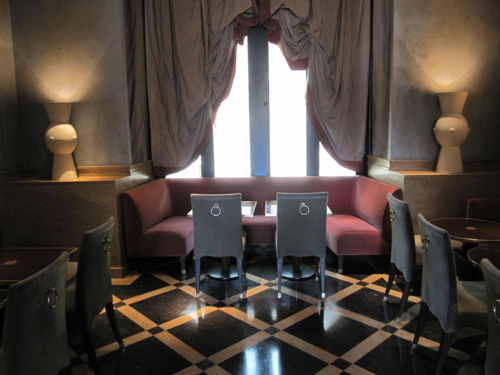 The dining rooms are well-designed, too, a bit plush, a bit sober, just right, I'd say. Service messy and poorly organized, it's true, you have to wait long for a table (if you get one at all), you're ignored by the staff, you're not served, the bill isn't coming - yes, yes, yes. But think a bit outside the box: all of this just gives you more time to look around and enjoy the atmosphere and the idea to have a glass or a cup of coffee or a light meal inside the Louvre.